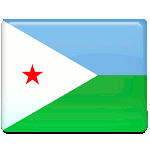 Independence Day in Djibouti is celebrated on June 27. This public holiday commemorates the day that the Republic of Djibouti proclaimed its independence from France in 1977. Djibouti is a small country located in the Horn of Africa, bordered by Eritrea, Ethiopia, Somalia, the Red Sea, and the Gulf of Aden. During the antiquity, its territory was part of the ancient kingdom named the Land of Punt and then the Empire of Aksum. Shortly after the Migration of Muhammad (Hijra), Islam was introduced to the area from the Arabian Peninsula. Following the introduction of Islam, the territory of present-day Djibouti became part of the Ifat Sultanate and then the Adal Sultanate and the Eyalet of Egypt. The French began to colonize Djibouti in 1862 by signing various treaties with local sultans. The first French colony in the region was established in Obock according to a treaty with the local Afar rulers. In 1894, Léonce Lagarde was installed as the French colonial governor in the region. He established a permanent French administration and named the protectorate French Somali Coast (Côte française des Somalis), or French Somaliland. During the Second World War, the colony was briefly administered by the collaborationist Vichy government. In 1942, French Somaliland was occupied by the British troops, who handed over control of the colony back to France after Germany’s defeat in the war. When the war ended, the colony became an overseas territory of France. In 1960, the neighboring colonies of British Somaliland and Italian Somaliland gained independence and merged to form the Somali Republic. In Djibouti, a referendum was held to decide whether it would remain with France or join the newly created republic. The majority of voters favored a continued association with France. The second referendum to determine the fate of French Somaliland was held in 1967. According to its results, the territory remained in association with France (although a looser one) and was renamed the French Territory of the Afars and the Issas (Territoire français des Afars et des Issas). However, there were reports of vote rigging by the French authorities to tip the odds in their favor. Announcement of the referendum results was followed by civil unrest, leading to several deaths. The third, and final, plebiscite was held on May 8, 1977. The overwhelming majority of voters supported independence from France. After a short transition period, Djibouti officially became an independent republic on June 27, with Hassan Gouled as its first president. The anniversary of Djibouti’s independence is celebrated as the country’s national holiday, Independence Day. Djibouti Independence Day celebrations include flag hoisting ceremonies, speeches by the President, Prime Minister and government officials, award ceremonies, parades, cultural programs, and other festive events and activities that take place throughout the country. Many storefronts are decorated in the colors of the national flag on the occasion.